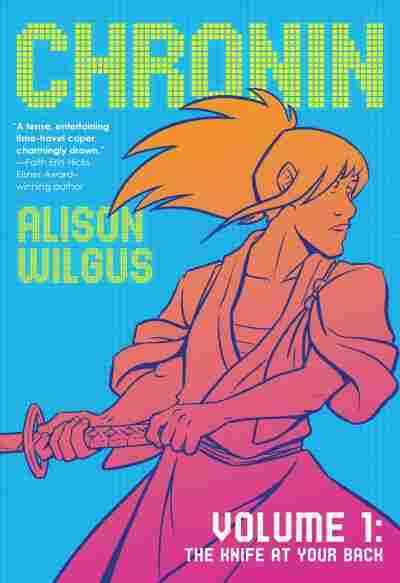 Book Review: 'Chronin,' By Alison Wilgus Alison Wilgus' graphic novel imagines a time-traveling history student from 2042 New York who finds herself trapped in Japan in 1864, masquerading as a male warrior as she tries to find a way home. Let's hear it for cleverness! Sometimes a few modest, well-thought-out ideas can add up to an artistic creation as impactful as — and even more appealing than — the weightiest projects. That's the case with Chronin, Alison Wilgus' new graphic novel. Like a miniaturist or scrimshaw engraver, Wilgus has a keen appreciation for the power of constraints. By setting careful limits on what her book will look like and what kind of story it will tell, she's achieved an aesthetic balance that's a thing of beauty in itself. Chronin is lighthearted but not frivolous, simple but not simplistic. Since it's set in 19th-century Japan, you could compare it to a netsuke: A tiny sculpture whose beauty lies in what it does with so little. Chronin's narrative and visual themes are rather basic, but it explores them in a way that's precise, insightful — and supremely clever. Wilgus has experimented with artistic constraints before. A Stray in the Woods, published in 2013, originated as a Tumblr webcomic driven by suggestions from readers. And, of course, much of her work has been shaped by the will of her employers, including DC and the Cartoon Network. Plenty of creators try to blow the doors off with their first solo graphic novels, but Wilgus takes the opportunity to go small. Chronin's story of a time-travel screw-up is familiar, even a bit of a chestnut. Protagonist Mirai Yoshida, a New York City college student in 2042, travels with some classmates back to 1864 Japan to conduct research. An accident leaves her trapped there, so she masquerades as a male — and as a member of the warrior class — for safety while she tries to figure out a way back. Mirai has several adventures in the course of her quest (the second half of which will be told in a follow-up volume planned for September) but her story feels more like a parable than an epic. Just a few secondary characters turn up to help her, hinder her or simply provide perspectives on their world. But they, like Mirai herself, are developed with such economy and precision that they breathe. The political fervor of Mirai's ex-boyfriend Kuji is by turns inspiring, frustrating and alarming. When down-to-earth tea mistress Hatsu all but shrugs off the revelation that Mirai is from the future, it feels appropriate, not merely convenient. Sure, in real life Hatsu would probably be more gobsmacked by the revelation — just like she'd probably talk with more archaic formality — but Wilgus knows the reader doesn't need such a scene, so she carves it away. 'Chronin' is lighthearted but not frivolous, simple but not simplistic. If Wilgus errs, it's in making the story a little too light. We never really worry about Mirai's fate, only about whether she'll manage to avoid tainting history with her presence. But while Mirai's predicament may feel more irksome than tragic, Wilgus' lovely artwork makes it well worth exploring. She's chosen to stick to a cool (in both senses of the word) gray-and-white palette; it gives every page a sense of poise and allows her to pour her attention into complex compositions. These are laid out in minimalist lines and rigid geometries. Sometimes she'll turn a streetful of run-down houses into a harmony of tidy little boxes; other times she'll copy the stepped way Japanese landscape paintings use vertical space. Wilgus' character designs, too, cleverly reference Japanese styles. In their warrior garb, Mirai and Kuji look like samurai from Ukiyo-e woodcuts crossed with characters out of Rurouni Kenshin — but with all unnecessary pattern and ornament buffed away. Wilgus' artistic restraint isn't just visually pleasing — it's also humble. It seems to say that this Westerner isn't trying to cannibalize or exoticize Japanese culture, but only to offer a few new angles on its well-established forms. The book's spare lines, unassuming story and uncomplicated-yet-likable characters aren't just self-effacing: They're also classic. Chronin seems timeless in more ways than one — but then, cleverness often does.